If you want to share an iCal event with others, often the best way is to send them a .ics file that they can then double-click on to import into their calendar. The easiest way to do this is to just click on the event and drag it onto the desktop, which will automatically export it to a .ics file for you. The icon even shows you the date of the event. You can then email this file as an attachment, or share it however you want. If the desktop isn’t in view, it can be a bit tricky to drag the event as it doesn’t behave how you would expect when using Exposé or the Command-Tab switcher. In this case, it’s best to drag it up to the toolbar at the top of the iCal window, then hit the show desktop exposé shortcut (normally F11) and drop the event on the desktop. 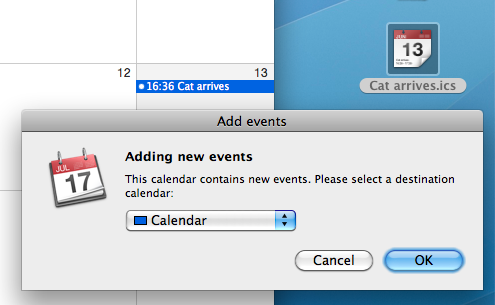 When the recipient of the file double-clicks on it, iCal will open up and ask which calendar you want to import the event into.